* Carlo Coccia was a famous musician in his times. He died in 1873 and the city council decided to pay homage to him by giving his name to the theatre. 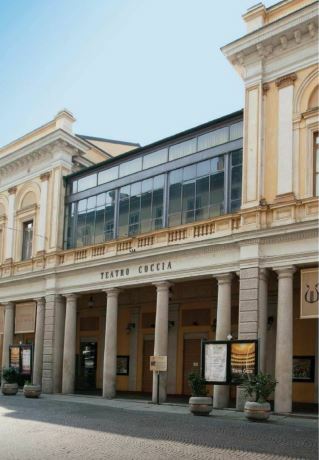 Proceed your visit and head to Teatro Coccia, the main city Theatre or, better, Opera House. Inaugurated on 22 December 1888, the Coccia was built on the foundations of a theatre built in the second half of the 18th century and designed by the architect of the pope Cosimo Morelli, with interior frescoes, and a curtain portraying Hercules (Novara's mythical founder) made by the Galliari brothers. This theatre (The Morelli), however, soon proved too small for the performances of the time. The reconstruction was entrusted to Luigi Canonica, who had previously designed Milan's Carcano Theatre and restored the Teatro alla Scala. 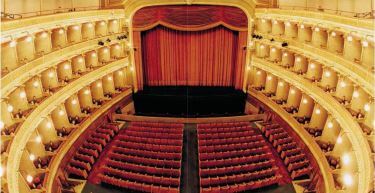 The new theatre was inaugurated in 1832 with a performance by composer Vincenzo Bellini called “La Straniera” (the Foreigner). A second theatre, called "Il Sociale", was then erected between 1853 and 1855. The two buildings were quite different, also because they played different roles: one was the symbol of the aristocracy, the other a recognition of the important role played by the rising middle class. In 1889, the Municipality bought both the Sociale and the Morelli (known as the Coccia since 1873*) with the idea to replace them both with a new theatre. The first design, submitted by Andrea Scala, considered the re-use of both the old theatres for other purposes and the building of a new one. ​This, however, was regarded as too costly, and the Milanese architect Giuseppe Oliverio was asked to draw up a new design. This was re-worked several times before it finally got the approval of the city Council. The new Coccia soon replaced the old one in the lives of the Novaresi. It seems that some of the old theatre boxes were provided with fireplaces for two reasons: to keep the rich audience warm and to allow them to cook something during some long performances. In the summer of 1800 Henry Beyle, an 18-year-old second lieutenant came to Novara with his troop and went to the theatre to see the opera “The Secret Marriage” (Il matrimonio segreto) by Domenico Cimarosa. 17 years later, that lieutenant started using the pseudonym Stendhal and became a very famous writer. In a letter to his sister Pauline, he described that night at the theatre as a very special moment, and he revealed her that it was probably that night he understood there was an affinity between his soul and our country. The theatre he went to was very likely the Morelli. Before going to the Castle and discover something unusual about it, try to think about the streets and squares you went through. They are the streets and squares that offered a background to Miguel Cervantes’ characters in the comedy “El Laberinto de Amor” (The Labyrinth of Love), which is part of the collection “Eight Comedies and Eight Interludes”, published in 1615. The comedy is set in a city called Novara, which Cervantes probably visited during his tour of Italy, also considering the fact that the city at the time was under the control of the Spanish.